A writing colleague once told me about a warm-up exercise that helped him get settled. 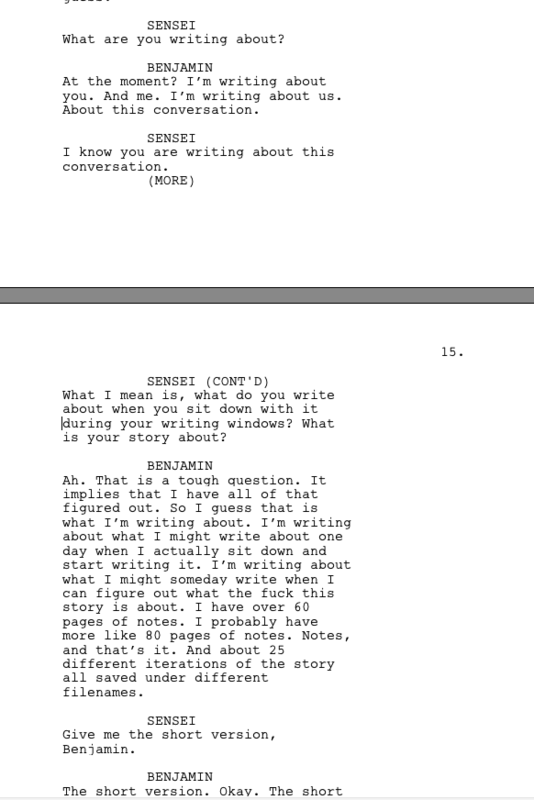 One of his favorite screenwriters talked about this exercise so he figured, “If it works for him…” He would start a conversation on the page between two characters. No scene description, no location; just two people talking. He would do this for 30 minutes and then start in on his script. He said the exercise helped him connect with his writing. He said that sometimes his characters would even help resolve story problems by talking things out. Not in a controlled way; his goal was not resolving a story issue; his goal was to get two characters talking. Just let them talk freely. And he said it helped. So I thought, “What the hell. I am not in a position to turn help down. I need all the help I can get right now.” I started doing the exercise. It always starts out with two people that don’t know what to say to one another. Then one of them notices something and their conversation takes off. For whatever reason, I wrote myself as a character the other night. I guess I needed to talk to someone, so I did. I started talking to a person named, Sensei. And I don’t care if Charlie Kaufman thinks I am narcissistic. I don’t give a damn about the ouroboros. I needed to talk. If you think I am insane, then you should see some of my other notes… All I know is that Sensei is cheaper than a therapist and has been asking me some difficult questions. And I can’t hide from him. It’s great. Thank you for listening, Sensei.